Geoffrey Everest Hinton CC FRS FRSC (born 6 December 1947) is an English Canadian cognitive psychologist and computer scientist, most noted for his work on artificial neural networks. Since 2013 he divides his time working for Google (Google Brain) and the University of Toronto. With David E. Rumelhart and Ronald J. Williams, Hinton was co-author of a highly-cited paper published in 1986 that popularized the backpropagation algorithm for training multi-layer neural networks, although they were not the first to propose the approach. Hinton is viewed by some as a leading figure in the deep learning community and is referred to by some as the "Godfather of Deep Learning". The dramatic image-recognition milestone of the AlexNet designed by his student Alex Krizhevsky for the Imagenet challenge 2012 helped to revolutionize the field of computer vision. Hinton was awarded the 2018 Turing Prize alongside Yoshua Bengio and Yann LeCun for their work on deep learning. 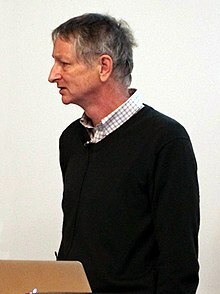 Hinton was educated at King's College, Cambridge graduating in 1970, with a Bachelor of Arts in experimental psychology. He continued his study at the University of Edinburgh where he was awarded a PhD in artificial intelligence in 1978 for research supervised by Christopher Longuet-Higgins. After his PhD he worked at the University of Sussex, and (after difficulty finding funding in Britain) the University of California, San Diego, and Carnegie Mellon University. He was the founding director of the Gatsby Charitable Foundation Computational Neuroscience Unit at University College London, and is currently[update] a professor in the computer science department at the University of Toronto. He holds a Canada Research Chair in Machine Learning, and is currently an advisor for the Learning in Machines & Brains program at the Canadian Institute for Advanced Research. Hinton taught a free online course on Neural Networks on the education platform Coursera in 2012. Hinton joined Google in March 2013 when his company, DNNresearch Inc., was acquired. He is planning to "divide his time between his university research and his work at Google". Hinton's research investigates ways of using neural networks for machine learning, memory, perception and symbol processing. He has authored or co-authored over 200 peer reviewed publications. While Hinton was a professor at Carnegie Mellon University (1982–1987), David E. Rumelhart and Hinton and Ronald J. Williams applied the backpropagation algorithm to multi-layer neural networks. Their experiments showed that such networks can learn useful internal representations of data. In an interview of 2018, Hinton said that "David E. Rumelhart came up with the basic idea of backpropagation, so it's his invention." Although this work was important in popularizing backpropagation, it was not the first to suggest the approach. Reverse-mode automatic differentiation, of which backpropagation is a special case, was proposed by Seppo Linnainmaa in 1970, and Paul Werbos proposed to use it to train neural networks in 1974. During the same period, Hinton co-invented Boltzmann machines with David Ackley and Terry Sejnowski. His other contributions to neural network research include distributed representations, time delay neural network, mixtures of experts, Helmholtz machines and Product of Experts. In 2007 Hinton coauthored an unsupervised learning paper titled Unsupervised learning of image transformations. An accessible introduction to Geoffrey Hinton's research can be found in his articles in Scientific American in September 1992 and October 1993. In October and November 2017 respectively, Hinton published two open access research papers on the theme of capsule neural networks, which according to Hinton are "finally something that works well." Notable former PhD students and postdoctoral researchers from his group include Richard Zemel, Brendan Frey, Radford M. Neal, Ruslan Salakhutdinov, Ilya Sutskever, Yann LeCun and Zoubin Ghahramani. In 2001, Hinton was awarded an Honorary Doctorate from the University of Edinburgh. He was the 2005 recipient of the IJCAI Award for Research Excellence lifetime-achievement award. He has also been awarded the 2011 Herzberg Canada Gold Medal for Science and Engineering. In 2013, Hinton was awarded an Honorary Doctorate from the Université de Sherbrooke. In 2016, he was elected a foreign member of National Academy of Engineering "For contributions to the theory and practice of artificial neural networks and their application to speech recognition and computer vision". He also received the 2016 IEEE/RSE Wolfson James Clerk Maxwell Award. He has won the BBVA Foundation Frontiers of Knowledge Award (2016) in the Information and Communication Technologies category "for his pioneering and highly influential work" to endow machines with the ability to learn. Together with Yann LeCun, and Yoshua Bengio, Hinton won the 2018 Turing Award for conceptual and engineering breakthroughs that have made deep neural networks a critical component of computing. Hinton is the great-great-grandson both of logician George Boole whose work eventually became one of the foundations of modern computer science, and of surgeon and author James Hinton. who was the father of Charles Howard Hinton. Hinton's father was Howard Hinton. His middle name is from another relative, George Everest. He is the nephew of the economist Colin Clark. He lost his first wife to ovarian cancer in 1994. Hinton moved from the U.S. to Canada in part due to disillusionment with Ronald Reagan-era politics and disapproval of military funding of artificial intelligence. Hinton has petitioned against lethal autonomous weapons. Regarding existential risk from artificial intelligence, Hinton typically declines to make predictions more than five years into the future, noting that exponential progress makes the uncertainty too great. However, in an informal conversation with the noted AI-risk alarmist Nick Bostrom in November 2015, overheard by journalist Raffi Khatchadourian, he is reported to have stated that he did not expect general A.I. to be achieved for decades (“No sooner than 2070”), and that, in the context of a dichotomy earlier introduced by Bostrom between people who think managing existential risk from artificial intelligence is probably hopeless versus easy enough that it will be solved automatically, Hinton "[is] in the camp that is hopeless.” He has stated, “I think political systems will use it to terrorize people” and has expressed his belief that agencies like the N.S.A. are already attempting to abuse similar technology. Asked by Nick Bostrom why he continues research despite his grave concerns, Hinton stated, "I could give you the usual arguments. But the truth is that the prospect of discovery is too sweet." – a reference to a remark by J. Robert Oppenheimer when questioned about why he had proceeded with his research in the Manhattan Project. According to the same report, Hinton does not categorically rule out human beings controlling an artificial superintelligence, but warns that "there is not a good track record of less intelligent things controlling things of greater intelligence". ^ Gregory, R. L.; Murrell, J. N. (2006). "Hugh Christopher Longuet-Higgins. 11 April 1923 -- 27 March 2004: Elected FRS 1958". Biographical Memoirs of Fellows of the Royal Society. 52: 149–166. doi:10.1098/rsbm.2006.0012. ^ a b Zemel, Richard Stanley (1994). A minimum description length framework for unsupervised learning. proquest.com (PhD thesis). University of Toronto. OCLC 222081343. ^ a b Frey, Brendan John (1998). Bayesian networks for pattern classification, data compression, and channel coding. proquest.com (PhD thesis). University of Toronto. OCLC 46557340. ^ a b Neal, Radford (1995). Bayesian learning for neural networks. proquest.com (PhD thesis). University of Toronto. OCLC 46499792. ^ a b Salakhutdinov, Ruslan (2009). Learning deep generative models. proquest.com (PhD thesis). University of Toronto. ISBN 9780494610800. OCLC 785764071. ^ a b Sutskever, Ilya (2013). Training Recurrent Neural Networks. proquest.com (PhD thesis). University of Toronto. OCLC 889910425. ^ Daniela Hernandez (7 May 2013). "The Man Behind the Google Brain: Andrew Ng and the Quest for the New AI". Wired. Retrieved 10 May 2013. ^ "Geoffrey E. Hinton – Google AI". Google AI. ^ a b Rumelhart, David E.; Hinton, Geoffrey E.; Williams, Ronald J. (9 October 1986). "Learning representations by back-propagating errors". Nature. 323 (6088): 533–536. doi:10.1038/323533a0. ISSN 1476-4687. ^ a b c Schmidhuber, Jürgen (1 January 2015). "Deep learning in neural networks: An overview". Neural Networks. 61: 85–117. arXiv:1404.7828. doi:10.1016/j.neunet.2014.09.003. PMID 25462637. ^ "Geoffrey Hinton was briefly a Google intern in 2012 because of bureaucracy – TechCrunch". techcrunch.com. Retrieved 28 March 2018. ^ Somers, James. "Progress in AI seems like it's accelerating, but here's why it could be plateauing". MIT Technology Review. Retrieved 28 March 2018. ^ "How U of T's 'godfather' of deep learning is reimagining AI". University of Toronto News. Retrieved 28 March 2018. ^ "'Godfather' of deep learning is reimagining AI". Retrieved 28 March 2018. ^ "Geoffrey Hinton, the 'godfather' of deep learning, on AlphaGo". Macleans.ca. 18 March 2016. Retrieved 28 March 2018. ^ Dave Gershgorn (18 June 2018). "The inside story of how AI got good enough to dominate Silicon Valley". Quartz. Retrieved 5 October 2018. ^ Krizhevsky, Alex; Sutskever, Ilya; Hinton, Geoffrey E. (3 December 2012). "ImageNet classification with deep convolutional neural networks". Nips'12. Curran Associates Inc.: 1097–1105. ^ "How a Toronto professor's research revolutionized artificial intelligence | Toronto Star". thestar.com. Retrieved 13 March 2018. ^ 27 Mar, Emily Chung · CBC News · Posted:; March 27, 2019 6:00 AM ET | Last Updated:. "Canadian researchers who taught AI to learn like humans win $1M award | CBC News". CBC. Retrieved 27 March 2019. ^ Hinton, Geoffrey Everest (1977). Relaxation and its role in vision. lib.ed.ac.uk (PhD thesis). University of Edinburgh. hdl:1842/8121. OCLC 18656113. EThOS uk.bl.ethos.482889. ^ a b c Smith, Craig S. (23 June 2017). "The Man Who Helped Turn Toronto into a High-Tech Hotbed". The New York Times. Retrieved 27 June 2017. ^ "U of T neural networks start-up acquired by Google" (Press release). Toronto, ON. 12 March 2013. Retrieved 13 March 2013. ^ Ford, Martin (2018). Architects of Intelligence: The truth about AI from the people building it. Packt Publishing. ISBN 978-1-78913-151-2. ^ Hinton, Geoffrey E. "Geoffrey E. Hinton's Publications in Reverse Chronological Order". ^ Sabour, Sara; Frosst, Nicholas; Hinton, Geoffrey. October 2017. "Dynamic Routing Between Capsules"
^ "Yann LeCun's Research and Contributions". yann.lecun.com. Retrieved 13 March 2018. ^ "Current and Previous Recipients". David E. Rumelhart Prize. ^ Anon (1998). "Certificate of election EC/1998/21: Geoffrey Everest Hinton". London: Royal Society. Archived from the original on 5 November 2015. ^ "Distinguished Edinburgh graduate receives ACM A.M. Turing Award". Retrieved 9 April 2019. ^ "Artificial intelligence scientist gets M prize". CBC News. 14 February 2011. ^ "National Academy of Engineering Elects 80 Members and 22 Foreign Members". NAE. 8 February 2016. ^ "2016 IEEE Medals and Recognitions Recipients and Citations" (PDF). IEEE. Retrieved 7 July 2016. ^ "Vector Institutes Chief Scientific Advisor Dr.Geoffrey Hinton Receives ACM A.M. Turing Award Alongside Dr.Yoshua Bengio and Dr.Yann Lecun". NAE. 27 March 2019. ^ "Three Pioneers in Artificial Intelligence Win Turing Award". New York Times. 27 March 2019. Retrieved 27 March 2019. ^ "Fathers of the Deep Learning Revolution Receive ACM A.M. Turing Award - Bengio, Hinton and LeCun Ushered in Major Breakthroughs in Artificial Intelligence". Association for Computing Machinery. 27 March 2019. Retrieved 27 March 2019. ^ Salt, George (1978). "Howard Everest Hinton. 24 August 1912-2 August 1977". Biographical Memoirs of Fellows of the Royal Society. 24: 150–182. doi:10.1098/rsbm.1978.0006. ISSN 0080-4606. ^ Shute, Joe (26 August 2017). "The 'Godfather of AI' on making machines clever and whether robots really will learn to kill us all?". The Telegraph. Retrieved 20 December 2017. ^ Shute, Joe (26 August 2017). "The 'Godfather of AI' on making machines clever and whether robots really will learn to kill us all?". The Telegraph. Retrieved 30 January 2018. ^ Hinton, Geoffrey. "Lecture 16d The fog of progress" (PDF). ^ a b c d e Khatchadourian, Raffi (16 November 2015). "The Doomsday Invention". The New Yorker. Retrieved 30 January 2018.